A chance visit brought me to the works of a photographer from Delhi, who had clicked pictures of the rich, the powerful and the famous persons passing through the Indian capital during 1950s and 1960s. These were the works of Mr. Madan Mahatta (Mehta). He died earlier this year, but I am really glad that I could see his works and to know about him. I was in Connaught Place in Delhi and went to an Airtel shop to get a new SIM card. "You need two pictures for the SIM card and you can go to the photography shop across the road for it", the Airtel guy told me. I saw the board of "Photographers Mahatta" and walked in. The shop seemed full of cameras, tripods and other things necessary for photography, including a whole wall lined up with antique cameras. "Take these stairs and go up", a guy guided me. Upstairs had a photographer's studio with lights and reflectors. But there was no one there. While I waited, I looked around and saw a wall with some old black and white pictures, some of them hand-painted. 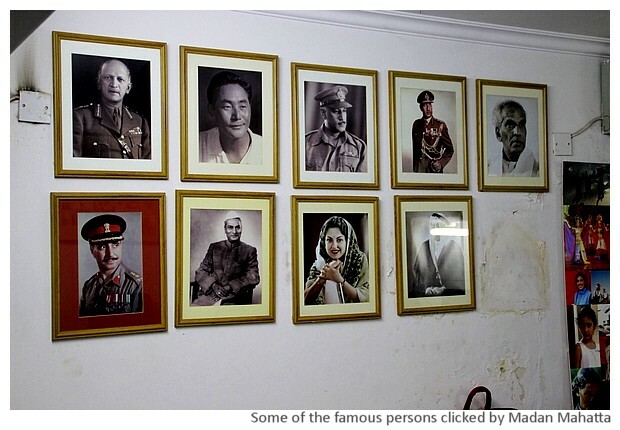 Going closer, I found that some of them were of well known persons - India's first president Dr Rajendra Prasad, Gayatri Devi of Jaipur, Everest climber Tenzing Norgay .. Soon a guy arrived and asked me to sit down on a stool. While he adjusted the lights, I asked him, "Who took those pictures?" "It was Mr. Madan Mahatta, the owner of this shop. 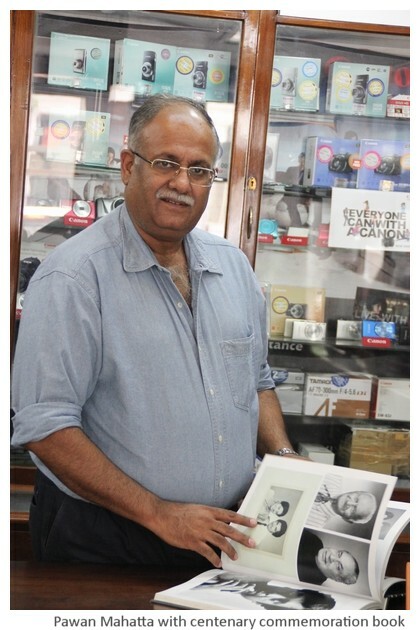 It is the oldest shop of photography in Delhi and next year we are celebrating our 100th anniversary", he told me proudly. Afterwards I talked to Pavan Mahatta, son of Mr. Madan Mahatta. He explained that their family was from Srinagar in Kashmir. Photography was initiated by their grandfather in Dalhousie in 1915, when he was 17 years old. 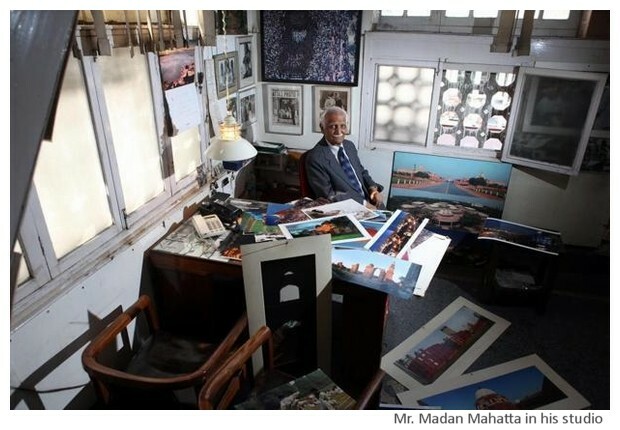 Madan opened his photography shop in M block of Connaught Place in 1947. He went to study photography at Gilford in England and after his return in 1954, set up the first colour lab for photographers in India. Pavan showed me a book that has been printed to mark the 100 years of photography by the Mahattas that has many examples of his father's works. "Queen Elisabeth of England, Jacqueline Kennedy, anyone who was famous and important, who visited Delhi, was photographed by my father in those days", he explained. His image archives have been partially digitalized and some of these images can also be seen on the Mahatta website. Madan Mahatta died on 6 March 2014 in Delhi. I had seen some of the works of well known photographer Sunil Jinah, especially some his iconic images of Mahatma Gandhi and of the tribals from different parts of India. But I hardly knew about any other significant photographers from the pre and early years of post independent India. I am glad that this chance visit introduced me to the works of Mr. Madan Mahatta. Though his architectural images have been exhibited, perhaps his other images also hide treasures that can be appreciated by art lovers and historians. On the other hand, it is remarkable that the Mahatta Photographers shop continues to be still active. Apart from its wonderful collection of vintage cameras that have made the history of photography, today it sells equipment from various brands like Nikon, Cannon, Sony, etc. and Pavan's son Arjun continues the legacy that had started in Dalhousie in 1915. 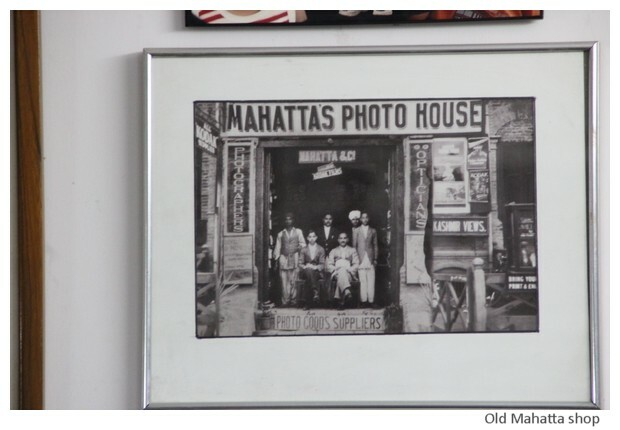 If you like photography and are near M block in Connaught Place, find time to go and visit the Mahatta shop! Mr Madan Mehta was addressed by me as Babuji. I had qualified as a Chartered Accountant in 1987 and was introduced by my colleague at a Merchant Banking firm at Connaught Place, New Delhi Mr Atul Bahadur Mathur who too had qualified in the 1987 batch as a Chartered Accountant in 1987 to his Chartered Accountant friend Mr. Pawan Mehta who had abandoned the idea of a practicing professional accountant and turned into a professional photographer instead. I had a penchant for photography from the the days of my CA studies and Articled Clerkship and had climbed the ladder stepping from the amateur to the serious amateur, and moving from the 6x6 inch 120 b&W film and the Voigtlander to the 35mm Canon A-1 SLR. So when Atul asked me for an introductory visit to Mahatta Photographers at M Block Connaught Place, I was very very interested. He did not take me from the shop entrance on the pavement, but from a back lane entry where a tea and a cold drinks small time shop had his benches drawn on the either side of the short narrow lane, and entered a narrow staircase winding up to the first floor foire that had a small waiting cabin and a counter for the cashier and a door that was usually shut next to his desk. There were two other doors two the left, one opening a small hall and the other the rooftop balcony, an uncovered space that had photographic instrument lying here and there and rooms that opened for staff photographers, dark rooms and a camera repair workshop. Coming back to the main door adjacent to the cashier's bureau, that usually remained shut for the privacy of the legendary doyne of Indian photography, Mr Madan Mehta, the father of my newly acquainted friend Mr Pawan Mehta ,a grand gentleman and an entertaining and charming elderly person with an ever smiling countenance and shining eyes that sparkled with intelligence. I do not know what made me do it, but instead of a formal handshake after the introduction by Atul, I knelt down and touched his feet, a practice that was to last for years of my visits and listening to his informative talks on photography, his life, spirituality (he was a very close associate and devotee of Guru Maharaj Charan Singh Ji of the Radhasoami Satsang) and history. He was an admirer of my Urdu and Persian Nastaleeq school of calligraphy and used to keep carefully my Waslis (calligraphy samples) with him as collections. He was also a great guide to lenses, photographic skills and handling of photo equipment. Those were the days of film (daylight negatives in colour and Kodak Tri-X Pan and color reversal slide films) photography and his guidance in both colour and black and white imagery had helped me not only to understand what perspective and depth of field meant, but also win UNESCO 1982 black and white 8 x 10 inches theme contest on Indian rural children second prize that included a Nikon FM-2 SLR body with Nikkor D series 50MM F/1.4, 85MM F/2.8, 70-210MM F/4-5.6MM zoom lenses set and the Speedlight SB-700 flashlight all combined in an aluminium box! I am sad that these things have no use today. Babuji always had a cup of excellent hot coffee served to me every time I came to see him. I saw him last in 2012 before leaving Delhi for Calcutta. I of heard his passing away in 2014 from friends visiting me and the sadness was immense. May my pranaams be delivered by holy spirits who govern our souls in the other world, to my respected and beloved Babu Ji. May he receive them with the same grand smile that I used to see in this life. Thanks Shyamal for reading my post and for sharing your own personal memories of Mr. Madan Mahatta, which give us another glimpse of his life. Hugely appreciated. Thanks for allowing me to share my thoughts on my Babu Ji! I have a very pressing request for you and that is to rectify my typing of the year of my winning the 2nd prize in the UNESCO B&W Rural Children of India contest, typed in here as 1982. Actually it took place in 1992.